Soft shelled clams, Mya arenaria, are produced by the millions each year and raised in the hatchery until large enough for interim transplantation. Ultimately they will be used to re-seed clam flats. The Down East Institute for Applied Marine Research and Education, a nonprofit, government- subsidized educational and research operation, has been instrumental in studying soft-shell clams (Mya arenaria) and educating the public about this resource. 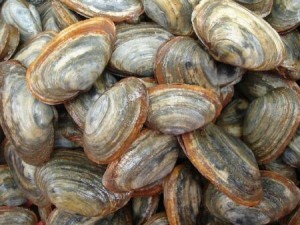 The hatchery produces millions of 1/4 to 1/2-inch soft-shell clams each year by spawning broodstock and raising the juvenile clams through to transplant size. 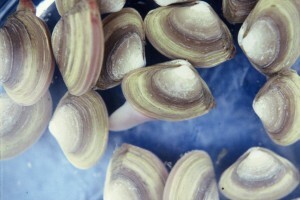 To induce spawning, broodstock clams are “shocked” by moving them from 50F seawater to seawater warmed to 70F. The change in temperature causes clams to release eggs and sperm into the water. Fertilized eggs (a two-inch female clam may contain 1 million eggs) are collected and placed in large tanks in the hatchery where they are raised until the clams are 1/15 inch long. They are then placed in floating trays, 15,000 clams per tray, and are transported to the Mud Hole, three miles from the hatchery. The young clams are left in the trays to grow until they reach transplant size. Finally, local clam flats are seeded with the 1/2-inch transplants. Hatchery personnel teach the general public, town shellfish committees, and clammers about the life cycle of clams and clam flat management. Seeding a depopulated clam flat involves transplanting young clams to traditionally productive areas that now have low clam populations due to overharvesting by humans; natural predation by birds, fish, crabs, moonsnails, sandworms, bloodworms; or poor recruitment. The seeded area is covered with nets to keep out predators, and the transplanted clams are left to grow until they reach market size. Clammers benefit from this management strategy. In recent years, DEI and industry researchers have been collaborating to evaluate of the aquaculture potential of Arctic surfclams, Mactromeris polynyma (shown right) for culture in eastern Maine waters. The hope is that this tasty, cold water clam may one day be commercially cultured in Maine’s colder waters.